Also I wanted to remake some old Allied tank. you can answer "fat" if it's not beefy, but something else (even if it's not fat in your opinion). HOPEFULLY FINAL EDIT: Updated. 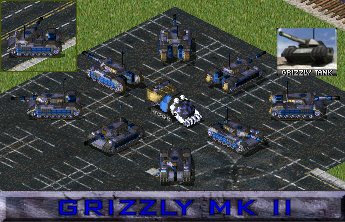 There are 3 versions in the pack now (standard, one with grey instead of brown (grizzg) and one with metalic blue instead of brown (grizzmb)). I used #90 and darker as main colour, because I was afraid of too bright voxel, but TS normals are darker than RA2 ones. EDITED a bit (the brightest colour is #88 now, see the first post). I really like it, it's just that I'm not used to seeing colors on voxels from the 160-167 range! I like making public stuff! in the end I pasted the final picture into Grizzly cameo background. ah dam you did massively edit it, thought it was a 3d render. I've gotta learn some GIMP....its just sitting there on my desktop, rotting away from the lack of usage. 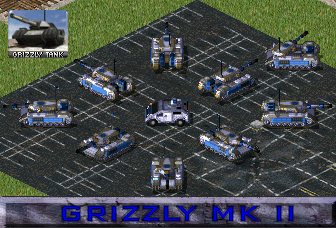 on the other hand I am thinking about public 3DS model of Tiberian Twilight beta Mammy. Dny, I gotta ask, does your name stand for Do Not Yigger? I just made up Yigger, cause I didn't know what your name stood for. I really hate brightly schemed voxels, so I like this new Grizzly! It's not too dark at all but just right. But that's just me, 7/10. like Oshog, I love it. It looks so muck more kickass than the current one. It needs shading with some brighter colors, on the remap also, a bit to much detail IMO, and it kinda looks a bit muddy. I hope you looked on picture which is up to date. shading: there are some places I can brighter a bit more, but there's still danger of crapness. A bit too much detail? Huh? I know it's detailish, but it's not pixelated. i agree with Dny, it looks a bit dark, other than that good work!! Both the cameo and the voxel are top notch. I have uploaded new version with slightly brighter colours on top places. @Deformat: I have ICQ, but I plan to create my QiP and maybe Skype account. What i meant was that the colors kinda blurred together. The new one is much better. so the brightest metalic colour was the #90 (the voxel with RA2 normals glows if if the colour is brighter than 87). Maybe KeePass is a useful tool for you. Then you only have to remember one password. Hmm, I will think about it. BTW, what are the criterias for spotlight? Make it a shade lighter, and I think it's worth spotlight! I have brighten it up again. Is it bright enough now or still too dark? So how, is it bright enough or still too dark? I think it might need to be brighter by one or two more colors. Probably too, I meant brown colours should represent dirt, but grey shades and details can look dirty in the result. Spotli-Wait whats that neon blue stripe above/on the treads on the S view? I found and fixed one bug which happened during last edit (weaker kind of black dots syndrome), otherwise it seems to be finished, just tell me, I will fix if there is something wrong. So it's not good enough for spotlight? Its look great and the use of TS normals work, but it doesn't really fit RA2 with its dull and dark design. The cameo is great too. Its always good to see more people that can turn voxels into RA2-style cameos. If you want to make it fit RA2 better, increase the contrast and brightness of the lit faces (see the original Grizzly cameo) and make that antenna stick out less. but to tell the truth, if the spotlight-forum wasn´t that crap-filled, then your voxel should be spotlighted. it maybe doenst´t really fit RA2-voxels but if you plan to replace westwoods crapy voxels it doenst really matter. You can start by looking at page 3. Yes, some of those voxels were great when they were made, but like the editors and voxel artists have improved, spotlight doesn't or shouldn't stay in one place, if you understand what I mean. I dont understand sh*t from the zip, which one is the version2 with TS Normals? normal (with brown parts) is just grizz.